Cheese paratha recipe with step by step photos. Easy to make stuffed paratha with spicy and flavorful cheese and boiled corn filling. Cheese paratha recipe is very popular and always a hit with toddlers and kids. We have eaten cheese paratha in restaurants few times, though I liked it to an extent I always felt the cheese flavor and taste is kind of over powering. So whenever I make cheese paratha recipe at home I used to add some finely chopped bell pepper and make cheese capsicum paratha. 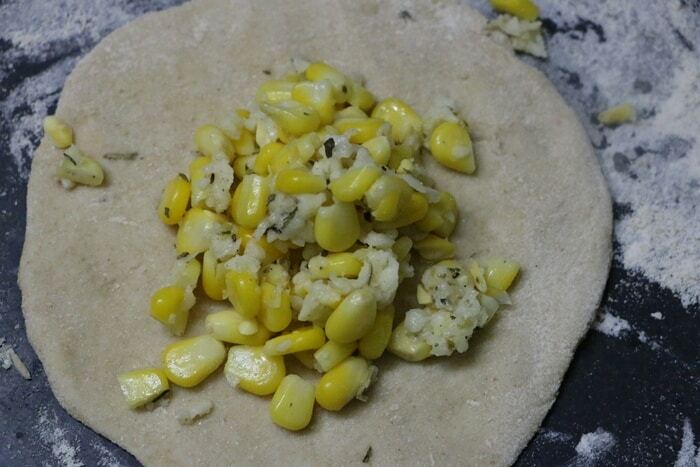 This time when I made cheese paratha I used some sweet corn too. I just pressure cooked the sweet corn kernels and added to the grated cheese, added salt, pepper and some mixed herbs. I completely skipped chili powder to just get pizza flavor in stuffing. 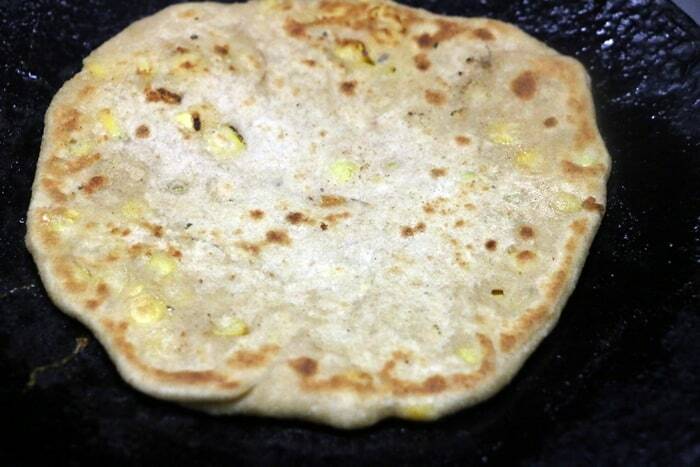 To make plain cheese paratha just leave out corn and increase the quantity of grated cheese. To make cheese paratha use nice quality mozzarella cheese that melts on heating. I used my regular pizza cheese. You can add sweet corn kernels to make corn cheese paratha or bell peppers or even grated carrots to make veg cheese paratha. The seasoning is totally your choice, I have used just salt, pepper powder and dried mixed herbs. You can add chili flakes, paprika powder or even chaat masala, chili powder combination. Parathas are healthy and wholesome meal for toddlers and kids and one can create so many parathas with different vegetables and lentils. Even fussy eaters who are not interested in vegetables will eat a paratah with nice raita or pickle. You can create fun shapes like triangle paratha, square paratha or even cut the normal round paratha into wedges or small circles before serving to make it more interesting. Here this cheese paratha is served with sauce as I felt raita will not be very suitable as the filling is kind of fusion. Here is how to make cheese paratha recipe with corn-cheese filling. Cheese paratha recipe with step by step photos. 1. Take 1/2 cup whole wheat flour, salt and required water in a mixing bowl. Knead to soft and pliable dough and set aside. 2. Steam, boil or pressure cook sweet corn kernels. Drain and take in a mixing bowl. Add grated cheese and mix well. 3. Add salt, pepper powder and dried herbs. Mix well and set aside. 4. Divide the prepared dough into 4 equal parts. Divide the filling into 4 equal parts too. 5. Take one dough ball and roll into small circle. Keep one portion of cheese corn filling in the center and close from all the sides. Roll again carefully into a thick paratha. 6. Place the rolled paratha on a hot tava and cook from both sides with butter/ghee. Repeat the same with remaining dough. Serve cheese paratha hot with sauce. Cheese paratha recipe, stuffed Indian flat bread with flavorful cheese-corn filling! Take 1/2 cup whole wheat flour, salt and required water in a mixing bowl. Knead to soft and pliable dough and set aside. Steam, boil or pressure cook sweet corn kernels. Drain and take in a mixing bowl. Add grated cheese and mix well. Add salt, pepper powder and dried herbs. Mix well and set aside. Divide the prepared dough into 4 equal parts. Divide the filling into 4 equal parts too. Take one dough ball and roll into small circle. Keep one portion of cheese corn filling in the center and close from all the sides. Roll again carefully into a thick paratha. Place the rolled paratha on a hot tava and cook from both sides with butter/ghee. Repeat the same with remaining dough. Serve cheese paratha hot with sauce. 1. Add seasoning as per your choice. cheese paratha looks so wholesome and tasty.